West Worcestershire MP Harriett Baldwin has praised volunteers who are leading the efforts to return the Malvern Cube community centre to full operation following a major fire. The centre, on Albert Road North, was seriously damaged by a fire last month, destroying a recently installed new kitchen and backstage area. Events continue to run at the popular venue and community groups are still meeting as normal. The MP visited the centre last week (Friday September 21) to see the extent of the damage and to show her support to the Cube’s management team. Harriett commented: “The Malvern Cube is a fantastic local resource and it was reassuring to know that the centre’s operation has been largely unaffected by the fire. “It has gone from strength to strength since Worcestershire County Council leased the building to local people who have worked so hard to create this community asset. 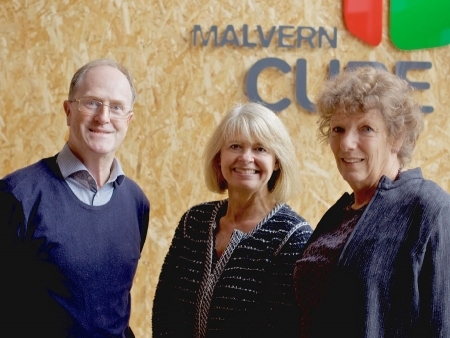 Photo: Malvern Cube’s treasurer Matthew Chuck, Harriett Baldwin MP and trustee Jill Terry.